It’s all about a smooth, even-toned face, your best concealer and balanced brows that are filled in carefully. At least, that’s my take on rocking dark, black lips as a dark brown girl. It’s not impossible, it’s just strategic. I’m a believer that in order to rock any intense, dark color against darker skin, your foundation has to be perfect, your concealer the same and your brows filled in to balance out your lips. This all sets the tone for the intense color. Here, I’m wearing Kat Von D’s Everlasting Liquid in Pitch Black. Before you even attempt to put this color on, scrub, scrub and scrub your lips some more. Okay? Smooth lips are a must. Exfoliate with your favorite product or use your toothbrush and run warm water on top and give those lips a gentle exfoliation. Moisturize with a thin layer of lip balm, like EOS. I do mean thin. You don’t want the liquid lipstick, which is matte, to not adhere to your lips and rub off easily. I added lashes by Vegas Nay and added icy eyes to the mix with the Marc Jacobs Style Eye-Con #3 palette in The Mod ($39). Notice I don’t have a lot of blush on, which you know I love. I kept it simple with a dab, and I do mean a dab of MAC’s Ambering Rose blush. It’s so minimal you’ll have to squint to see a trace of it. Moral of the story: dark girls can wear black lipstick. 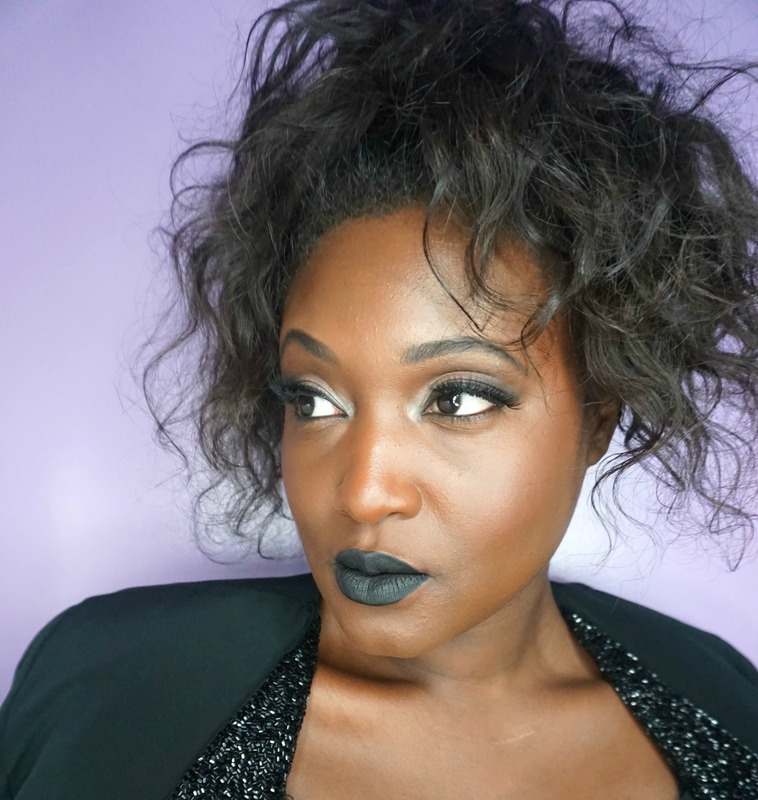 I have another black lippie look to show this week too, so stay tuned!